The new Samsung OLED TV is an outstanding-looking set, with stylish, somewhat curved screen balanced within a metallic stand that's rectangular in shape. The Samusng TV curve helps to create a more immersive watching experience, giving its viewers a sense that the Samsung OLED TV is larger than its real screen dimensions. From viewer's seating location, you can see the curve from the frame's outer profile, which has a curved contour at the bottom and top of the screen, much similar to a cinerama projection screen in movie theaters. One advantage to the TV's stand, it provides a little extra space to house many arrays of speakers. The TV can also produce very good quality sound, at adequate volumes to fill an average-sized room. Samsung's OLED TV makes use of "active" 3D technology that works with active-shutter glasses, which yield complete 1080p resolution, with amazing deep blacks and bright image. Samsung OLED TV is slightly angled back on its stand; hence it faces a little upward. This shows that the ideal position for the Samsung TV is below or at eye level to the screen. Due to the curve, there's an implied watching sweet spot which limits the best possible seating position to two or three viewers straight in front of the screen. 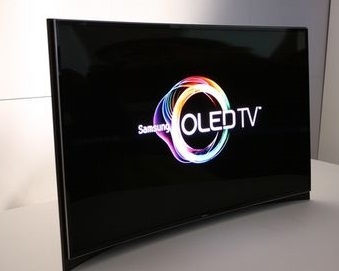 However, unlike that of many LED TV's, this TV's high definition picture does not seem washed out while you move off the angle from the center of the Samsung TV. Unlike the other OLED TVs, Samsung's is incredibly thin; possibly half an inch thick although it is not pretty as noticeable because of its position within the stand. All the connections, for instance a Blu-ray player or a cable box are made to the Samsung TV through a separate module that includes an Ethernet slot, four HDMI inputs, a USB port (there are other two extra USB ports on this TV), an antenna input and a component-video input. The module will then connect to this Samsung TV using one proprietary cable, thus minimizing visual clutter. The only additional cable is the power cord of the Samsung TV. Samsung is not the first OLED TV. There were others such as Sony XEL-1 which cost $2,500 when it was introduced. It had a small, 11-inch screen that made it unsuitable to be used as a main TV. Making larger sets has been a big challenge, but Samsung OLED TV was worth waiting for. It is arguably the most excellent all-around Samsung TV, with the top overall picture-quality perfomances and without major shortcomings.